NEW DELHI- Globally renowned for tea estates that produce some of the most delicate, and highly-prized teas, India’s mountainous Darjeeling region was rocked for most of the 1980s by strikes and protests by the indigenous Gorkha community, who were demanding the area be turned into a separate state within the Indian union. The movement ebbed in the late 1980s, when Darjeeling was granted some autonomy within its present state of West Bengal. But this weekend the Himalayan region has been shut down once again. Businesses and elite boarding schools are closed, transport suspended, and tourists have been sent away as Gorkha political leaders enforce an indefinite strike in a ‘do or die’ push for statehood. The abrupt revival of the long-dormant agitation for a Gorkhaland state was triggered by the ruling Congress party’s decision last week to create India’s 29th state, Telangana, following a highly emotional campaign by residents demanding separation from the rest of the large south-eastern state of Andhra Pradesh. The Congress agreed to create Telangana in the hope that it would be able to secure most of that region’s 17 parliamentary seats in the next election, either directly or through an alliance with the local political party that has led the agitation for statehood. As the electoral contest heats up, Congress, facing much disillusionment over its record in office, may feel that it could reap dividends by supporting demands for other would-be states, and the agitators behind them. The outlines of the existing map were laid down by a post-independence states reorganisation commission that recommended division into linguistic states. This was done to defuse strife in an ethnically diverse population, and to ensure that local governments operated using their citizens’ mother tongue. Since that initial post-independence exercise, New Delhi has thrice tinkered with its internal map, creating clutches of new states, most recently in 2000, when a government led by the Hindu nationalist Bharatiya Janata Party carved three new states out of three Hindi-speaking states. “The ability of the Indian government to create new states has allowed it to accommodate regional demands and regional aspirations in a way that helps India to stay together,” says Ms Tillin, author of Remapping India: New States and their Political Origins, a book coming out this year. Indian states vary widely in size, but the average population is about 30m people per state, compared to around 7m in Brazil, 6m in the US, or 4m in Nigeria. However, India’s largest state, Uttar Pradesh, has nearly 200m people – which would make it the sixth biggest country in the world if it were independent. Across India, clamour is rising for smaller political units. Many analysts believe these could lead to more effective and more responsive local administration, as well as better service provision. Demands for new states, many of which date back decades, tend to be strongest in poor, culturally distinctive regions, whose residents feel neglected or exploited by elites from more prosperous areas of their state. Yet, in Uttar Pradesh, politicians from the wealthiest belt also want to break away from a larger state they see as a drag on their region’s development. The division of states is not easy and can unleash equally fervent opposition. In Andhra Pradesh, Congress faces a fierce backlash against the granting of statehood to Telangana, and allowing it to keep the IT boomtown of Hyderabad as its capital city. Still, politicians leading statehood campaigns across India appear to believe they have all to play for in an election year, when both the Congress and its rival BJP are likely to fall far short of a majority and will have to vie for potential coalition partners to form a government. On Friday, members of the tribal Bodo community, an ethnic minority group demanding a separate state carved out of the tea-growing northeastern state of Assam, staged protests that severed the main railway link between northeastern India and the rest of the country, causing chaos. Such disruptions could be more common in the months ahead. There has been an uproar in India’s parliament over the decision of the ruling Congress party-led coalition to back the new state of Telangana. Several MPs raised banners protesting against the move in the upper house, leading to a short adjournment. 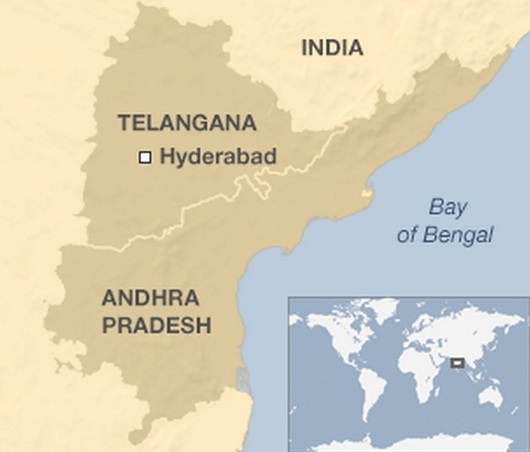 Telangana would comprise 10 districts of the state of Andhra Pradesh, including the city of Hyderabad. The final decision lies with parliament. Andhra Pradesh’s state assembly must also give its approval. There have been protests for and against the creation of India’s 29th state in recent years. Supporters say the Telangana area has been neglected by the government. Opponents are unhappy that Hyderabad, home to many major information technology and pharmaceutical companies, would become a shared state capital. HYDERABAD- An impasse over Telangana has hit research work in educational institutions as new collaboration among universities located in all the three regions are on hold. The University Grants Commission (UGC) has in fact refused to release funds worth Rs 60 crore for some collaborative projects till the state formation gets finalized. The further delay in formation of Telangana state, could only postpone the release of funds further, sources said. “The UGC needs a clear understanding of what the collaboration would be before they release funds. The modes of collaboration between universities in state are different from those in other states. And the release of funds for different projects is different,” an official from Osmania University said. OU has been collaborating with Andhra University on student exchange programmes for social science departments. The project which needs UGC approval is a collaborative study on microbiology, worth Rs 15 crore. As per UGC norms for collaborative research projects related to state universities, the varsities in question should explain why their research would benefit the state. With the division, UGC must be told which state would be the beneficiary of the research work. “UGC should also be intimated whether the project is national or state specific. In science projects, the field work would spill into both the states after the division, thereby increasing the estimated cost of the project,” said a source from Kakatiya University, Warangal which has had a tie up with Srivekateswara University in the field of plant microbiology. Even Jawaharlal Nehru Technological University (JNTU)-Hyderabad which is running collaborative research projects with other JNTUs in Anantapur and Kakinada is reconsidering some of its research collaborations. Researchers working with samples spread across undivided Andhra Pradesh are also worried about the impact the division would have on their work. Some of the research projects taken up by institutes of repute like National Institute of Nutrition (NIN) are also currently going slow because of Telangana trouble. “Research works of independent researchers were pre-approved by the state government as they involved large sample sizes which spread across undivided Andhra Pradesh. These will now have to be approved afresh by the new state governments,” rued a senior researcher. However, most researchers of institutes including NIN said that the confusion would last only till they get detailed correspondence from the state government.